Ah, gingerbread. Can you think of a scent so warm, comforting, and synonymous with “the holidays are approaching”? Gingerbread was first baked in Europe around the 11thcentury, when crusaders brought ginger as well as other new and exotic spices back from the Middle East. At first, gingerbread was mainly baked by Catholic monks and used in religious ceremonies, but over time it became more and more popular throughout the continent. 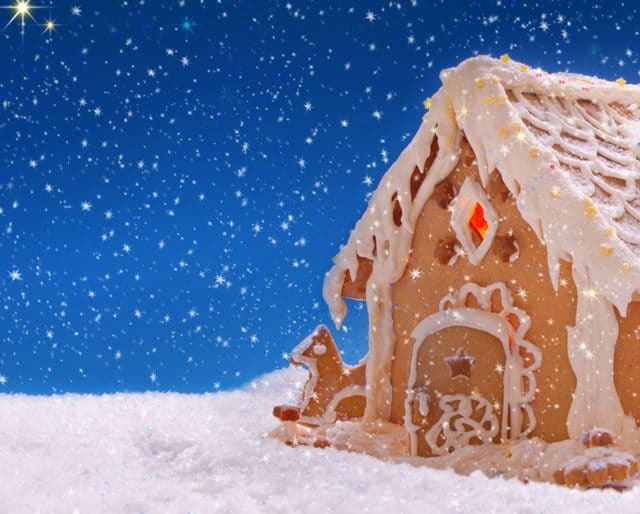 The Germans created the tradition of baking a house out of gingerbread around the holidays in the 16thcentury, but the practice didn’t become as popular as it is now until the publication of a certain fairy tale a few centuries later. German immigrants to America brought the gingerbread house tradition across the ocean with them, and now we see it everywhere, from home kitchens to department store holiday window displays. So celebrate National Gingerbread House Day this December 12th! Gingerbread dough is surprisingly easy to make. You might need to run to the store for the spices (ground ginger, cinnamon, and cloves) and molasses (another key ingredient), but we’re willing to bet almost everything else is already in your pantry. The hardest part is appropriately measuring out the walls and roof for your gingerbread house before you bake them. If you have extra dough, why not make some gingerbread men and women to go along with it? Bake or buy a bunch of gingerbread house pieces plus white frosting and tons of colorful candy pieces. Invite friends of all ages, throw on some holiday tunes, and see who can make the most beautifully decorated gingerbread house. Just don’t get too competitive. Come December, these drinks seem to crop up on coffee shop menus all across the country. But if you can’t seem to find one near you, it’s easy to replicate. Either buy gingerbread syrup or make your own by simmering water, sugar, ground ginger, cinnamon, and allspice on the stove until it reduces and thickens. Mix the syrup with a shot of espresso and top it off with warm milk. Then you’ve got holiday cheer in a mug, no barista required. People in Europe had been eating gingerbread for centuries, but we can thank the Brothers Grimm for the popularity of gingerbread houses. They published Hansel and Gretel in the 19thcentury—remember that one? It’s the fairy tale where a witch lures the brother and sister into captivity in her house made out of gingerbread and candy, and then tries to fatten them up to eat them (spoiler alert: they escape!) The story became immensely popular in Germany, and people started baking gingerbread houses at the holidays as a result. There’s nothing like a good old-fashioned arts and crafts project to make you feel like a kid again. And that’s even more true when the materials for your crafting are a) edible and b) chock full of sugar. Throw in the childlike excitement that comes out in people of all ages around the holidays? That’s the trifecta right there. Plus: ginger is good for you, right? The main flavor in gingerbread is, duh, ginger. It’s what gives gingerbread that warm holiday taste and subtly spicy kick. Ginger also happens to have a whole host of health benefits: it can help with indigestion or nausea, is anti-inflammatory, and might even lower cholesterol levels, lower heart disease risk factors, and have some cancer-fighting properties.Sure, it’s probably better to eat it on its own, but it’s the holidays—we won’t tell.